For a sign with a Wow! 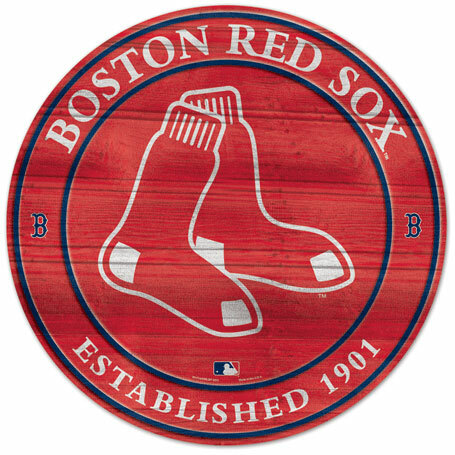 factor, the wooden Red Sox roundel is it. Made of 3/8" thick hardboard, a wood product that won't split or crack, this unique 19.75" diameter sign has a distressed design that gives it an antique wood finished appearance. The round Red Sox sign has two small Boston logos on each side and the team's primary logo takes up a large portion of space on the large sign, which has a matte finish to keep the aged imagery from actually aging. In keeping with its historic theme, the sign lists that long ago year (1901) in which the Red Sox franchise was established. You can easily hang the team-colored roundel wherever you want inside, as a keyhole-style strip is already drilled into its backside, and the sign has precision cut smooth edges for no worry handling. Size: 19.75" x 19.75" x 3/8"